Summer is finally here and the annual Operation Independence campaign has begun. Last year the community helped us raise $30,000 to continue our services in Sheridan County! We truly could not do what we do without your generous support! Our services help people remain independent, in their homes, for as long as possible. Jan Lind and her husband Dave are a couple who have benefitted from our work and our mission. They are a living example of what our services can do. 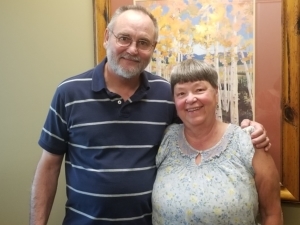 After dealing with a series of personal hardships, Dave and Jan embarked on a new adventure by moving to Sheridan over 10 years ago. At the time they had no friends or family to lean on and were both actively looking for work. Shortly after moving here, Dave began working at Whitney Benefits and he is still employed there today. Jan started work at the Children’s Center where she worked for about seven years before accepting a position in the Sheridan College cafeteria. She worked at the College for three years, when suddenly her world came to a stop. With communication problems interfering with their marriage, Jan and Dave knew that something was wrong. Shortly after, Jan went to see her doctor who informed her that the frontal lobes of her brain were shrinking at a rapid rate. Jan was diagnosed with Dementia. “I was very angry, I was very sad, I was very – everything. It just was like my whole world was crushed.” Jan’s doctor suggested that she stop driving, and Dave and Jan began searching for a way she would be able to travel around town. That is when her doctor recommended that they check out the Senior Center, now The Hub. Jan felt like she lost her independence. She could no longer do things that had once been part of her everyday life. After visiting The Hub, Jan decided that she would enjoy spending her time here. Being involved in our various programs such as Goose Creek Transit, Activities, Volunteering, Meals and Dementia Friendly Wyoming, Jan said the Center quickly became a second home to her. 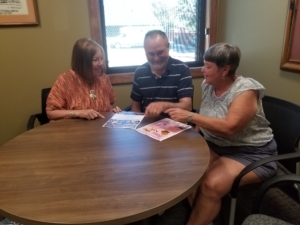 However, after attending our Caregiver Support Group, facilitated by Stella Montano Director of Family Caregiver Services, Dave was able to find that he was not alone. He now had a place where he could talk with people who were going through the same things and find resources to help him and Jan.
All of this wouldn’t be possible without the community’s support. We need friends like you, to help us fulfill our mission…to celebrate, embrace, and serve older adults for the betterment of our community. This is truly a campaign for all of us! Please consider a gift to The Hub today. Your support, no matter the size, will help us to sustain our essential services for seniors. Did you know that private donations, from individuals like you, foundations, and other community partners, make operations at The Hub possible? To continue our work, over $500,000 needs to be raised every year. How can you help? Whether it’s through an annual giving campaign, like Operation Independence or Holiday Spirit, there are plenty of opportunities to give back. Perhaps you are interested in giving to our endowment, which secures funding for The Hub well into the future. Currently, our Celebrating Generations & Building Community Campaign has set a “10 in 10” goal, meaning we are wanting to build our endowment to $10 million in 10 years! Some may be curious about giving a capital gift to the CG&BC campaign and project! Endowment and CG&BC gifts have various recognition opportunities, as well. Maybe you are curious about planned giving, which includes donations of stocks and bonds, monetary gifts and pledges, life insurance, or estate and willed gifts. Feeling ready to donate? Click the “Ready to Donate” button below to be taken to our secure online donation form! At The Hub, we believe that gifts can come in other ways too! Looking to make a time contribution? Visit our Volunteer page! Would you like more information about contributing to The Hub? Fill out the contact form below and our Development Director, Skye Heeren, will be in touch! Please check what donation option(s) you would like more information concerning. Thank you! Skye Heeren is looking forward to talking with you more! Your gift matters!